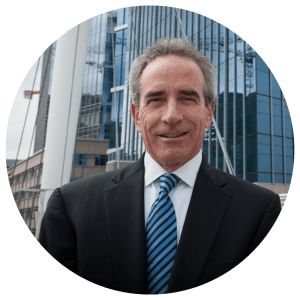 Bill Mosher, senior managing director at Trammell Crow Company, is mid-way through his term as Chairman of the Downtown Denver Partnership’s Management Group Board of Directors. We recently caught up with Bill to check in on his perspective as the organization works to build an economically powerful center city. The Partnership’s leadership in ensuring diversity of housing type and affordability has made significant advancement over the past year beginning in May, when the Colorado legislature passed construction defects legislation. In September, the Partnership announced the development of an employer-focused housing plan. Perhaps most exciting, is the LIVE Denver program launched, thanks to the leadership of Partnership Board Member Mike Zoellner. This public-private partnership is designed to create affordable housing options by connecting vacant market rate units with workforce families and individuals. In addition, our “day to day” work continues to be successful – well-attended and informative events, successful public events, strong management of the Downtown Denver Business Improvement District, including continually improving safety programs, significant advancement in planning and executing for multi-modal transit, and more. We also ensured that Downtown Denver has a project in the GO Bond Program that will support the center city’s vitality for decades to come. I am excited about a renewed focus on economic development. Randy Thelen is the Partnership’s new Vice President of Economic Development, and he will bring focus on workforce development and emphasis on the revitalization of upper Downtown. In addition, we’ve worked closely with the City and RTD on plans to re-develop the 16th Street Mall. This is an ongoing project that has been supported by Board chairs before me, and those who will be leading the Partnership after me. The current Environmental and Alternatives Analysis process has yielded a recommended design, and we look forward to continuing to work with all Mall stakeholders on this next phase of one of the city’s most vital connectors and important public spaces. We talk a lot at the Partnership about ‘city building’. How do you define that term? People make place happen – and it takes intention to make it happen through participation and broad-based commitment. At the core, the success and role of the Partnership is that it helps create a civic infrastructure for political will and vision, and to get things done. One of the great things about Denver is that we’re inclusive, and we measure people’s contribution by an ability to make things happen. We are open to new thinking, and we encourage people to look beyond just private or personal interest and to embrace a broader civic interest. The Partnership is the place where placemaking happens, and creating place is a job for everyone. Yes, we are currently looking at the future of what membership means at the Partnership, and making sure we’re responsive to members and stakeholders. I don’t think Denver has become the city it is by accident. We have been intentional, engaged and thoughtful. The Partnership is a source of vision and action.. Regardless of what your personal goals are, there is a place for talent and passion for the city to be expressed There is a unique way to become involved in the future Downtown through your engagement with the Partnership and our placemaking vision. What advice would you give current Members to increase their engagement this year? I encourage members to explore opportunities to get involved with the Partnership – join a council or committee, attend our events to learn and engage, participate in the Urban Exploration trip, or encourage your younger employees to join CityBuild. There are so many ways to engage. Our goal is to ensure that the Partnership is a forum for your voice that is convenient, relevant and pertinent to how you want to engage. There are several ways and avenues for your voice to be heard and for you to be active, and we’ll be expanding these opportunities in the coming year. Take advantage of this opportunity to be a visionary city builder, and we’ll continue to ensure that we’re creating different ways for you to find the best path for engagement. You’ve had a storied tenure with the Partnership, what motivates you to stay involved? First and foremost, I’m a native of Denver and I love this city and want it to be successful. I’ve always believed downtown’s are the core of any city, a place that defines a City and its people. I’ve been involved in downtown redevelopment for more than 40 years. Downtown is the one place that people can come together and call their own – downtowns should help unify a community, be inclusive and respectful, and be a place people can call their own. Finally, the Partnership is a superior organization. It has a proud history with more than 60 years of longevity and relevance. We are rooted in private sector involvement and participation, and there are few places you can go to have more civic impact than the Partnership.